Rep. Virginia Foxx, R-North Carolina, chairwoman of the House Education committee, presides over markup of the PROSPER Act in December with ranking Democrat Democrat Rep. Robert C. “Bobby” Scott. Photo credit: EdWorkforce.house.gov. A proposal put forward by House Republicans to place tighter limits on federal student loan borrowing by graduate students would be likely to “severely depress the market” for advanced degrees — especially among students who aren’t working or getting tuition breaks as teaching assistants or researchers. That’s according to Jeffrey Selingo, a higher education policy wonk who says graduate school has already lost some of its allure, thanks to tuition increases and the rise of alternatives like coding boot camps and “MicroMasters” programs. Writing for The Washington Post’s Grade Point blog, Selingo says that although interest in advanced degrees in some well-paid fields like computer science, engineering, and health sciences remains strong, overall grad school enrollment has plateaued. Demand in other areas, such as for master’s degrees in business administration (MBAs), has largely been propped up by international students, he says. According to the National Center for Education Statistics, enrollment in all postbaccalaureate master’s, doctoral and professional degree programs grew by 36 percent from 2000 to 2010, but has been relatively flat since then. The NCES projects that enrollment will start picking up again this year. But that projection was made before the introduction of the Promoting Real Opportunity, Success, and Prosperity through Education Reform (PROSPER) Act, a proposal by House Republicans to revamp the provision and repayment of federal student loans. The 542-page PROSPER Act was introduced in December to take care of an important bit of housekeeping. The bill would reauthorize the Higher Education Act, the 1965 legislation that spells out the rules and provides funding for the federal government’s higher education programs. The act is typically reauthorized every four to six years, but Congress hasn’t managed to achieve that feat since 2008. The last major changes to federal student loans — made in 2010, when Democrats last held a majority in both the House and Senate — were bundled up into legislation that helped create Obamacare. The Health Care and Education Reconciliation Act of 2010 made the government a direct provider of federal student loans, rather than a backer of loans made by private lenders. That legislation also expanded income-driven repayment programs, which allow borrowers who are having trouble making the payments on their federal student loans to devote as little as 10 or 15 percent of their monthly discretionary income to paying down their education debt. Now, House Republicans who want to scale back the government’s role in student lending are working to push through the biggest changes to the student loan system in nearly a decade. Conservatives worry that taxpayers will end up footing the bill as more borrowers — particularly grad students who often have six-figure student loan debt — rush into income-driven repayment programs that can provide loan forgiveness after 10, 20 or 25 years of payments. The PROSPER Act would close the door for future borrowers to enroll in income-driven repayment programs that offer such “time-based” forgiveness. 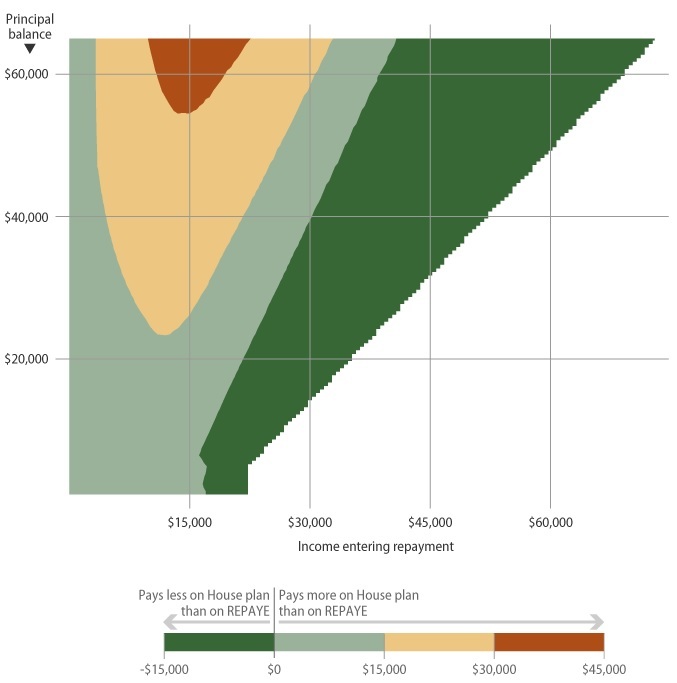 But the bill would create a new income-driven repayment plan with limits on total interest charges that would save many borrowers more money in the long run (see analysis below). To keep graduate students from taking on so much debt in the first place, the bill would also phase out their access to federal PLUS loans. Many might be forced to turn to other sources of funding, such as private student loans. The PROSPER Act would also increase the cost of borrowing for students who qualify for-need based aid, eliminating interest rate subsidies for loans to undergraduate students of limited means. Getting rid of the subsidy means interest charges would start racking up on their loans while they’re in school. As was the case with the recent battle over changes to the tax code, many of the proposals put forward by the House may be less popular in the Senate. Groups representing students and universities successfully lobbied against plans by House lawmakers to eliminate the student loan interest deduction and tax tuition waivers and discounts for grad students. The PROSPER Act has already been approved by the House Education Committee, putting it on track for a vote by the full House. All eyes in the world of higher education are now on the House bill. Students, college administrators and policy experts are waiting to see if the Senate will roll out a competing bill this spring that’s a less radical departure from the status quo. Before introducing their own bill, members of the Senate Education Committee are holding a series of hearings and gathering input from many perspectives — something House lawmakers were criticized for not doing. The PROSPER Act would limit borrowing by graduate students by taking away their federal student loan of last resort — the PLUS loan. Although PLUS loans carry the highest rates (7 percent) and fees (4.26 percent) of any federal loan, they do have a couple of things going for them: They’re easy to get, and students can use them to cover all of their unfunded expenses, right up to their school’s certified cost of attendance. That’s one reason PLUS loans are in the crosshairs of Republican lawmakers. Critics say that if the only limit on federal borrowing is the school’s cost of attendance, schools can just keep raising their tuition and fees, and students will borrow more. (The so-called “Bennett hypothesis” — that rising college costs are driven by easy access to financial aid and loans — dates to 1987, is still widely debated, with skeptics pointing out that cuts in state funding have also played a role). But it’s generally agreed that graduate students claim a disproportionate slice of the federal student loan pie — and are the major beneficiaries of income-driven repayment programs that allow borrowers to stretch out their payments, in many cases qualifying for loan forgiveness. According to a pair of related research briefs by the Urban Institute, grad students constitute only 17 percent of student loan borrowers, yet they take out 38 percent of federal loans. The Urban Institute also found that 86 percent of students seeking professional degrees in fields like law and medicine must borrow, as do 70 percent of students those going after master’s degrees. But only 35 percent of students pursuing research doctorates borrow — many receive stipends and free or discounted tuition in exchange for the teaching and research duties they take on. Because of the high rates and fees they carry, grad students don’t turn to PLUS loans until they hit the $20,500 annual or $138,500 lifetime limits for more affordable federal direct loans. To help graduate students cope without PLUS loans, the PROSPER Act would increase the upper borrowing limits on federal direct loans to grad students to $28,500 a year, with a lifetime limit of $150,000. Medical school students and others pursuing certain health-related degrees would be allowed to borrow up to $235,500, up from $224,000 today. Also, PLUS loans would be phased out rather than eliminated all at once. Grad students taking out PLUS loans out before July 1, 2019 would be allowed to keep taking them out through Oct. 1, 2024. That’s small consolation for groups like the American Association of Medical Colleges (AAMC), which says 47 percent of medical students currently rely on PLUS loans. 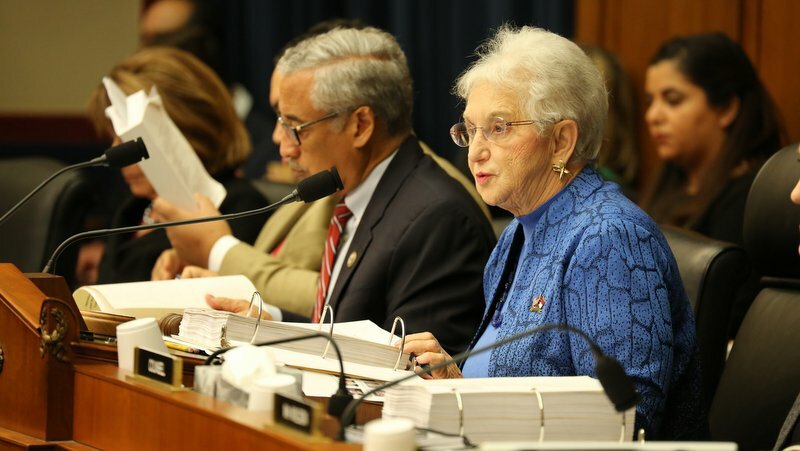 In a letter to Rep. Virginia Foxx, the North Carolina Republican who chairs the House Education Committee, the AAMC noted that 48 percent of doctors leave medical school with more than $200,000 in total debt, and that 14 percent have $300,000 or more. Eliminating PLUS loans would “have a disproportionate impact on the neediest borrowers and non-traditional students, forcing them to take out private student loans with less favorable terms to fully finance their education,” the group said. For those who can qualify, rates on private student loans can be competitive with PLUS loans. But private student loans typically require a cosigner, and may not offer all of the benefits and repayment options packaged with federal loans. Federal loans allow medical school graduates to defer payments during residency, for example, or enroll in income-driven repayment plans that limit their payments to 10 or 15 percent of their discretionary income. Once you take them out, interest rates on federal student loans are fixed for life. But rates for new borrowers are recalibrated every year, to take into account the government’s cost of borrowing. The PROSPER Act would leave the current system for setting rates on federal student loans in place, which means that borrowers taking out loans for the fall 2018 could pay more. Rates on federal student loans to new borrowers are indexed to 10-year Treasury notes, and increased in 2017 for the first time in three years. Recent changes to the tax code could lead the government to step up borrowing. That, coupled with healthy growth in jobs and wages, has interest rates headed up. Up-front fees on federal loans also add to their cost. The 4.264 percent up-front fee on PLUS loans, for example, adds about a full percentage point to the annual percentage rate (APR) paid by borrowers. One aspect of the PROSPER Act that’s been welcomed by colleges and student advocates is a proposal to do away with the up-front fees on all federal student loans. According to the National Association of Student Financial Aid Administrators, those upfront charges cost the average undergraduate $235 in fees and interest, and the average graduate student $1,145. The fees, which are currently 1.066 percent for federal direct loans, and 4.264 percent for federal PLUS loans, generate $1.6 billion a year in revenue for the government. Much of that money — $628 million – comes out of the pockets of graduate students. Although getting rid of up-front fees would be a welcome development for many, the PROSPER Act would also abolish subsidized loans to low-income students, which could cost some graduate students thousands in additional interest payments. Subsidized loans, which are available only to those who can demonstrate financial need, don’t start accruing interest until six months after students graduate, leave school, or drop below half-time enrollment. Interest charges on other federal and private student loans starts accruing as soon as a loan is taken out. Graduate students aren’t eligible for subsidized loans. But those who take them out as undergraduates benefit from the interest rate subsidy, because interest continues to be waived while they’re pursuing their next degree. The American Council on Education (ACE) has estimated that getting rid of subsidized student loans would cost the average undergraduate borrowing $16,141 to get their bachelor’s degree an additional $1,952 in interest payments, a 45 percent increase. That’s after taking into account the savings from getting rid of upfront fees. For graduate students who took out subsidized loans as undergraduates, the increase would be even more dramatic, because they’d be hit with two more years of interest before entering repayment. For that same $16,141 loan, graduate students would pay $3,798 in additional interest, an 87 percent increase. Through special programs aimed at encouraging public service and providing relief to struggling borrowers, the government is currently on track to forgive tens of billions in loans taken out by graduate students. That’s a source of alarm to some policymakers. Student loan borrowers who take jobs with the government or non-profits may qualify for Public Service Loan Forgiveness after 10 years of payments. And any student who takes out federal student loans can qualify for income-driven repayment programs that may provide loan forgiveness after 20 or 25 years of payments, depending on the program and the borrower’s debt burden and income. Estimates of how much student loan debt will be forgiven keep going up. One analysis by the Government Accountability Office (GAO) that looked at $352 billion in loans enrolled in income-driven repayment plans concluded that $108 billion in loan principal would ultimately be forgiven. Source: “Education Needs to Improve Its Income-Driven Repayment Plan Budget Estimates,” U.S. Government Accountability Office, November 2016. The interest collected on those and other loans that are fully repaid means that the government can afford to forgive billions in student loan debt without asking taxpayers to subsidize the federal student loan program. That’s according to a new report issued last week by the Department of Education’s Office of the Inspector General, which concluded that the department could have done a better job keeping decision makers and the public informed about the potential for costs to grow. The report noted that the Department of Education recently provided one industry group with an estimate that 600,000 borrowers will be eligible for Public Service Loan Forgiveness through 2025. Credible’s recent analysis of Department of Education statistics estimated that between 4.8 million to 7.2 million borrowers who are already paying back student loans might be eligible for Public Service Loan Forgiveness. But it appears that many — if not most — have yet to enroll in income-driven repayment plans that would allow them to take advantage of that program. Critics say loan forgiveness programs — and Public Service Loan Forgiveness in particular — provide a disproportionate amount of relief to graduate students, and may be contributing to the rising cost of grad school. The PROSPER Act would eliminate Public Service Loan Forgiveness for future borrowers, and shut the door on income-based repayment programs that offer “time-based” loan forgiveness after 20 or 25 years of payments. Although existing borrowers already participating in these programs could remain in them, they would be off limits to borrowers taking out their first loans after June 30, 2019. For borrowers taking out their first loans to attend school in the fall of 2019, the PROSPER Act would provide an income-driven repayment plan with a different form of loan forgiveness. The PROSPER Act would allow borrowers to pay as little as 15 percent of their discretionary income toward their student loan debt. Although they’d have to keep making payments for as long as it took to pay off their debt, borrowers would never pay more total principal and interest than they would under the standard 10-year repayment plan. That could provide greater savings than existing repayment plans, in which borrowers may rack up thousands of dollars in additional interest charges when they stretch out payments over a longer period of time. An analysis by the Center for American Progress found some borrowers — particularly those earning very modest incomes — would be better off in an existing income-driven repayment program, REPAYE. But the PROSPER Act’s income-driven repayment plan would be a better deal for borrowers paying back typical levels of student loan debt, the analysis showed. Source: “Pay Long and Don’t PROSPER,” Center for American Progress. Thanks in part to a $25 minimum monthly payment, the PROSPER Act’s income-driven repayment program would prove more costly than REPAYE for many low-income borrowers. For many graduate students with higher incomes and debt levels, the cap on interest charges provided by the PROSPER Act’s income-driven repayment program would be a better deal. A hypothetical graduate with $83,000 in student loan debt ($23,000 in unsubsidized undergraduate loans at 4.45 percent, and $60,000 in graduate school debt at 6 percent) would pay $904 a month in the standard 10-year repayment plan, or $108,509 in total. If the same borrower enrolled in REPAYE, one of the most popular existing income-driven repayment programs, they might pay pay $172,739 to retire their debt — $64,230 more than in the 10-year plan. (That estimate, generated by the Department of Education’s repayment estimator, assumes an adjusted gross income of $50,000, with payments starting out at $266 a month and stretching out over 24 1/2 years. It takes 25 years of payments for borrowers with graduate school debt to qualify for loan forgiveness in the REPAYE program). Under the PROSPER Act, borrowers could make smaller monthly payments in an income-driven repayment plan and stretch them out over many more years without being penalized with additional interest charges. The American Association of Medical Colleges acknowledges that the cap on interest charges “could reduce the cost of borrowing for medical students,” but that it would be advantageous if the cap was calculated before students begin their residencies — when many place their loans in deferment.